Summary: The heart of Friday Night Lights meets the emotional resonance and nostalgia of My So-Called Life in this moving debut novel about tradition, family, love, and football. As the high school football coach in his small, rural Maryland town, Dean is a hero who reorganized the athletic program and brought the state championship to the community. When he married Nicole, the beloved town sweetheart, he seemed to have it all—until his troubled wife committed suicide. Now, everything Dean thought he knew is thrown off kilter as Nicole’s death forces him to re-evaluate all of his relationships, including those with his team and his three children. I don't think you can read HOME FIELD by Hannah Gersen and not make some comparisons to Friday Night Lights. In fact, I saw on the author's website that the television show actually influenced her when writing this novel. 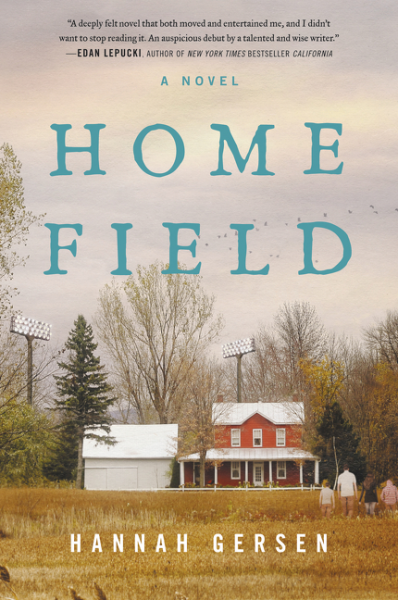 I love pretty much enjoy anything that has to do with football; and since I also love novels about dysfunctional families, I figured HOME FIELD would be a good match... and it was. I enjoyed this one quite a bit. HOME FIELD tells the story of Dean, a high school football coach and father of three. Dean's life was seemingly perfect. He married the town sweetheart Nicole and had the job of his dreams. He even won the state football championship for his high school. However, the unthinkable happened -- his wife committed suicide and Dean is left to navigate life and fatherhood on his own. As hard as it is to deal with the loss of his wife, Dean is also having to help his children deal with the void in their lives. Dean, who spent most of his waking hours coaching or thinking about coaching football, is now having to deal with his two young sons because his stepdaughter Stephanie has left town to attend Swarthmore. Robbie, the 11 year old, is acting out by running away from school; and Bry, the 8 year old, doesn't really understand what's going on and turns to his aunt's fundamentalist church as a way to cope. Nicole always handled most of the issues with the kids and then Stephanie filled in, and Dean is completely lost in how to handle his sons. Meanwhile, Dean isn't taking his wife's death very well either. Dean discovers that coaching the all-important high school football team in this town and parenting his children is just too much for him; and he is forced to take a step back from his coaching duties. As Dean does his best to keep his family together, he also has to help them (and himself) move forward. I really liked HOME FIELD. I was both entertaining and touched by the story. In addition, I was impressed with the author's writing as well as her character development -- these people were so flawed yet likable, and I thought she did an amazing job of bringing a small town and its cast of characters to life. All in all, it was a quality read and the characters' stories stuck with me after I finished the novel. What really impressed me, though, was how well the author handled the subject of grief. Ms. Gersen did a wonderful job in making the pain these characters were feeling real to the reader. At times, the sense of grief was almost overpowering to me. It was incredibly difficult to see how each family member tried to deal with it in his or her own way. Personally, I found Stephanie's ability (or inability) to handle her mother's death to be the most painful. For some reason, her desire to leave the small town and start her own life while also feeling the guilt of leaving her brothers was just so incredibly sad. I couldn't get her character out of my mind. While the main theme of HOME FIELD was definitely dealing with loss, I also appreciated how the author showed that the family was eventually able to cope and even move on. The book was sad, of course, but it also left me with feelings of hope. I don't want to say that everything was wrapped up neatly with a big red bow, but I did leave the pages of this book thinking that everything could be okay for these characters. Not that everything would be necessarily easy for them, but there was a sense that they could be happy in the future. I do think HOME FIELD would make a terrific book club selection. There is a reading guide available with eleven interesting questions. Some of the themes you might want to explore include grief, loss, guilt, home, family, acceptance, and forgiveness. I have a sense that many readers will relate to the characters' intense feelings of loss, so it could be a meeting that requires tissues! I found HOME FIELD to be a beautiful novel about loss and resilience. I definitely recommend it to fans of stories about dysfunctional families. You know I love football but can you believe I've never seen Friday Night Lights? I've never lived anywhere where high school football is a big deal. Having said all that, this sounds like my kind of book. I have this book sitting on my dresser right now. It's one I'm considering for my Country Woman magazine book club column. I just need to find time to read it before 11/3. Do you think older women (ages 55-70) would enjoy it too? This one jumped out at me right when it came out - solely b/c of the Friday Night Lights comparison! I read the sample and didn't get into it (though it was only 10%), so never bought the whole book. Maybe I'll have to reconsider.